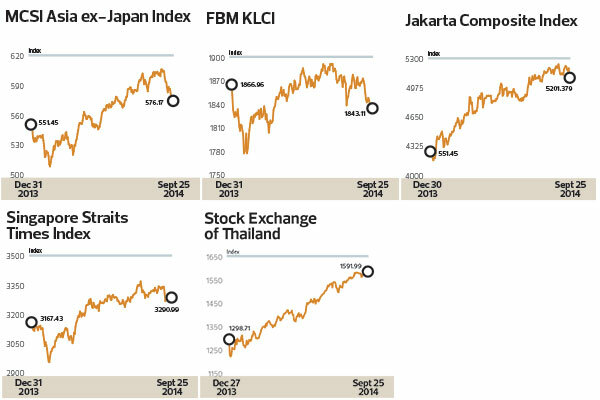 THE MSCI Asia ex-Japan Index has gained 4.48% year to date, but the FBM KLCI was down 1.42%. Within Southeast Asia, the local benchmark has also fallen behind the major indices, such as the Jakarta Composite Index (+20.08%), Stock Exchange of Thailand (+23.21%) and Straits Times Index (+3.94%). But Templeton Emerging Markets Group Senior Executive Vice-President and Senior Managing Director Dennis Lim believes there are interesting buys within the Malaysian equity market. This is despite the pricey valuations, relative to the rest of Asia. Currently, the FBM KLCI is trading at price-earnings (PE) and price-to-book (PB) ratios of 16.73 times and 2.24 times respectively, whereas the MSCI Asia ex-Japan Index’s PE and PB ratios are at 12.22 times and 1.48 times respectively. While Malaysia as a whole may look like an expensive market compared with the cheaper North Asian markets such as China and South Korea, Lim says there are attractive buys when investors break the market down into sectors. “You have to be a stock picker in this market. You have to look for triggers or events,” says Lim, who has been with the Franklin Templeton family for over two decades and co-manages several of its emerging-­market funds. In Malaysia, the Templeton Emerging Markets Group is “not excited” about the big-cap stocks for now. Instead, its research team has been focusing on mid-cap stocks. Lim says this is where the investment house is finding value, in companies that have not shown up on the radar screen of investors. “A lot of big investors come to Malaysia and they look at the 10 biggest companies, because they need the liquidity. They need to get in quickly and get out quickly. In our case, we are long term — we are looking to hold [the stocks] for five years. So, we can afford to buy into companies that are smaller, but it is not easy [to find these]. I’d like to think that our local research team provides us with an edge in finding these gems,” he adds. Lim shares that he has been able to find investing ideas in the local utilities sector because of the on­going rationalisation in the country that has put these companies in a better position to earn fairer returns than before. “The utilities sector has been ignored for a long time. It is heavily regulated and companies, until recently, have not been able to earn a decent return on investment. That has kept many investors away,” he explains. Lim does not shy away from expensive sectors if there is an opportunity to find attractive stocks there. He says TIME dotCom Bhd, a data-centric telecommunications company, is an example of an attractive find within the expensive telecoms sector. The company’s venture into broadband and data growth makes it attractive. Relative to the bread-and-butter telcos, it looks cheaper and has a good growth rate, he adds. Nevertheless, Lim says the investment house is generally careful about regulated industries, because it often implies that investors’ returns are capped. While that may be the case, he points out that regulated sectors can become attractive when there are changes in the industry. “If you are in a country where [market forces] have been distorted for a long time and they (the government) realise that they need free market forces to determine prices of gasoline, diesel, power, gas, sugar and others, then you see an opportunity during this transition period that you can benefit from. We’ll have to see how quickly this happens, how far they take it, whether they go to full market pricing or a fraction of market pricing,” he says, referring to the subsidy rationalisation situation in Malaysia. The Templeton Emerging Markets Group is also looking at consumer-related stocks because it believes that Malaysians have seen a significant increase in their disposable income, indicating that consumers have higher spending power now. But what about the high household debt’s impact on consumer spending? Lim says the high household debt issue is not confined to Malaysia. It can be seen in many other developed and emerging markets as well. Furthermore, he believes that the situation in Malaysia is not “hitting the ceiling” for now and adds that the central bank has already implemented measures to address this issue. He is not worried about the implementation of the Goods and Services Tax as he believes it will not leave a lasting impact on consumers. “There will be a one-time slowdown, then people forget and life goes back to normal. This is the scenario seen in other markets that have introduced consumption-based tax,” he explains. Nevertheless, Lim emphasises that being selective in the consumer stock space is pertinent. What he looks for are stocks with a specific niche, growth potential, the ability to go regional and possibly global, and have a forte that is difficult to replicate. Within the consumer sector, Lim says he avoids investing in companies that do not have pricing power with thin margins and are forced to compete head on with their peers. These companies, he says, usually have no comparative differences and would more often than not find themselves in the middle of a price war. Lim remains “cautiously optimistic” on Malaysian equities. He commends the government on the steps it has taken to cut back subsidies, saying that these changes are progressive for the country. He opines that the successful implementation of the subsidy rationalisation programme will be good for Malaysia and its stock market. “The fact that the government is able to implement and engineer some of these reductions on subsidy is a big step forward for the country. This is encouraging to see,” he says. This article first appeared in The Edge Malaysia Weekly, on September 29-October 5, 2014.